Google had some of the best jokes on April Fools’ day. One of those was Gmail Motion, a new technology allowing users to write emails and send them using complicated, full-body motions. 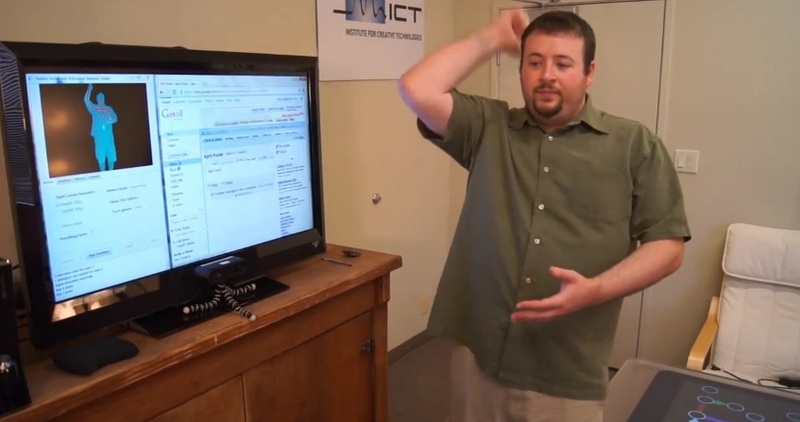 Having some fun on his own, a researcher at the University of Southern California Institute for Creative Technologies used a Microsoft Kinect sensor to make Gmail Motion a reality. The scary part is, it only took him a few hours. The team is calling this Gmail Motion recreation SLOOW, which stands for Software Library Optimizing Obligatory Waving. This is also a joke, as the lab’s actual Kinect toolkit has the acronym FAAST. You may remember the ICT. In late December, a video circulated showing this same man, Evan A. Suma, playing World of Warcraft entirely with body gestures on a modified Kinect. Kids, you may want to apply to get into this lab. They spend their days playing with Kinects and their coffee tables are actually giant capacitive touchscreens. So cool.